Big Fury is one of the most exciting full day tours in the Whitsundays! The Big Fury treatment will leave you totally in awe of this amazing boat and her crew! Her fast speeds and comfortable interior will allow you to enjoy your day in comfort. Big Fury ensures you get to do as much as possible during your one day tour, wasting no time cutting its way through the waters of the Whitsundays. Your day will start with a complimentary pick up from your accommodation, where your tour will begin at 10.00am. After enjoying a relaxing morning, you will make your way to the boat, where you will meet the fantastic crew who will be your guides for the day. They will brief you on your day and do a short intro to your fellow passengers before you cruise out to the open ocean. 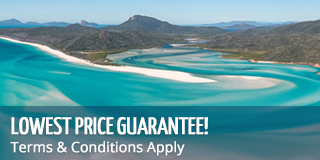 Get ready for an accelerated and exciting trip out to Whitehaven Beach, where you will spend 2 hours at your leisure and do the famous bushwalk to Hill Inlet Lookout. While on the world-famous island, you can also spend your time swimming, take a leisurely walk or simply relax on the white, silica sands. You will also get to snorkel during your day and enjoy an amazing buffet lunch on the beach. Big Fury offers a unique trip, with less travel time, meaning you get to explore more of the beauty that the islands have to offer. Fun from start to finish! If you're looking for a fun and thrilling day, with great crew and maximum time to adventure at each destination, this it the day trip for you! Don't miss out - book today! Fury is a 900 horse power custom designed, new generation fast ferry, powered by 4 massive outboards. She's like the Ferrari of the Whitsundays! Once Big Fury gets on her way, it isn't long before you can feel the acceleration kick in! Soon enough, you are zipping past the awesome scenery and other boats sailing and cruising the area. You will enjoy two hours on Whitehaven Beach and swim, relax, sunbathe or stroll along the 7km of pure white silica sands. You can go on a guided bushwalk up to Hill Inlet Lookout, where you can visit the infamous view of the swirling sands below in the heart of Hill Inlet. Your buffet lunch is served during your stay at Whitehaven Beach, a delicious Aussie picnic lunch. After lunch you'll make your way to the reef of the day, chosen carefully by your crew, where you will get to enjoy around 2 hours of snorkelling. You will get to see the beautiful coral formations and colourful fish below for a truly amazing experience. All snorkelling gear, tuition and flotation devices are provided. Enjoy one last wild ride as you make your way back to land, marveling at the boats and islands as you zoom by. Lunch will consist of creamy potato salad, Indian curry rice salad, tuna and vegetable pasta salad, Italian mixed salad, prawns, cold meats platter of silverside, premium chicken and roast beef, selection of fresh rolls, fresh fruit platter of pineapple, rock melon, watermelon and other seasonal tropical fruits platter. Optional stinger suits hire $5.00 (required to wear during stinger season Oct - May) Cash for additional on board purchases, snacks and soft drinks are available to purchase on board. All departures and itineraries are subject to weather and may be changed or cancelled at the discretion of the operator. It should be noted that adventure travel involves risk. Whilst we make every effort to safeguard clients, we cannot be responsible for personal injury or loss due to actions of our clients which are beyond our control. We recommend that all clients have travel insurance covering illness, injury, loss or damage to personal belongings or not being able to travel on the confirmed date of departure. Please be aware operators pass on credit card merchant fees so there is a non refundable 2.5% surcharge for VISA and MASTERCARD card purchases. All client cancellations forfeit 25% of total ticket price and all client cancellations made less than 21 days prior to departure will result in complete forfeiture of the full price of the trip. If the operator has to cancel the trip (prior to the boat's departure) and we cannot offer a suitable alternative, then a refund will be given, minus card fees. We strongly recommend that you have travel insurance especially during the wet season. Please note it is the responsibility of ALL passengers traveling to advise both your travel agent at the time of booking and vessel check-in agent before boarding of ANY medical conditions including food allergies you may suffer from. Thank you for booking with Mr Travel if you need any advice or assistance making arrangements for your accommodation or transfers please do not hesitate to ask. "We had heaps of fun, it was an entertaining and informative day, the food was great, snorkeling and sightseeing was beautiful. Couldnt be happier, well definitely be coming back to see these guys again! " "It was an amazing day out! Despite the cold and windy morning at the snorkelling spot the sealife was beautiful. The best part of the day was the time at the beautiful whitehaven beach. We were beyond glad that the most part of the day was spent there. Lunch was great. We went with adults and children and all had a blast the entire time. And last but not least the fabulous crew on big fury made the day great with lots of knowledge, humor and fun. Thanks. " "We had an absolutely incredible day. Excellent value for money and we felt very looked after. Staff were brilliant and made the day unforgettable. Lunch and cake were also very good, more than we expected and plenty to go round. Thanks for a day we will always remember"
"We had the best day ever!!! It was the last day of our holiday week. We had been on other tours, and big fury was by far the very best!!! Great guide, Braydon is wonderfully suited to his job and very comical, Matt the captain was lovely, food excellent, commentary informative and entertaining. Thank you very much, we would definitely do it all over tomorrow if we didn't have to leave "
"Thanks to Chris and Brayden for an incredible tour to whitehaven & snorkelling. Funny, informative and great with the kids and I who were first time snorkellers. 10/10 & would recommend to anyone and everyone to book a day tour with them. Will be back. 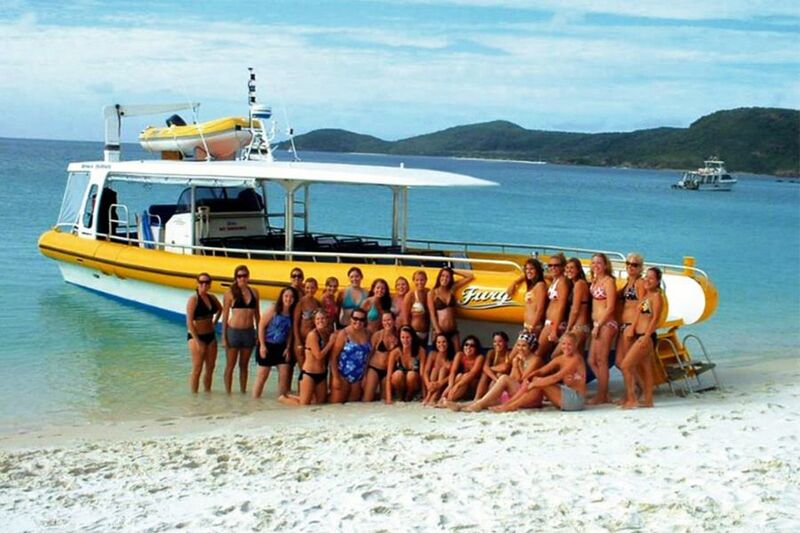 Thanks guys"
"If you are looking to check out the reef & Whitehaven Beach you need to do it with these guys. The guide & skipper both hilarious & make the tour that much more fun. Fantastic day, still buzzing hours later! We are planning the over night stay for our next trip! " "Well, where do I start. From the friendly face that greets you at your hotel, to the insane, insatiable, Deckhand Brayden providing running commentary, and jokes aplenty on the boat. We had a truly wonderful day out to Whitehaven Beach. The boat is superfast, We spent the first part of the day snorkelling at a place called Ravens Cove. Apparently the currents are too rough for snorkelling usually so this was an unexpected bonus. Did I mention that I actually swim like a lead brick, however my partner is part Mermaid, and has no fears of the water. Brayden and Chris were able to look after everyone , even non-swimmers like me. He took me out on his mini dinghy to see some of the coral so I felt included. Once we finished it was a fast hop over to Whitehaven Beach, which I have to say is as good as everyone says it is. Again, a top spread of food was put on for us, much more than I expected. Having lunch with the local monitor lizards is an experience, but don't worry apart from one particular Lizard known as 'Grumpy' who tried to have a Toe-to-Toe with Brayden, they will leave you alone. I have mentioned Brayden a few times in this review, but it's fair to say, he really goes out of his way to make the trip, and his enthusiasm is infectious. The price for the day was about 130 Australian Dollars, which is about £75 British Pounds. For me personally it was well worth the outlay"
"Awesome Fun Must Do if Your in Airlie Beach. OMG what a day we had. It was so awesome. Well worth the money. The skipper Matt is great and the deckie Loki really made the day. The skipper was always ensuring the customer where happy throughout the day and made us laugh so much. Big Thanks for the great pictures and the best fun ive had in the water"